Dream In Darkness: March Challenge and Great News! Welcome back and you have visited on a most special day in the house! We are all so excited we can hardly keep ourselves from dancing with the Frog! Now that is excited! Why? You may ask why all the commotion and cake being flung and confetti being eaten? Well, our own KIM is the new owner of Sin City Stamps!!! EEEEK!! How cool is that?? To celebrate even more we are going to be using Sin City Stamps this month!!!! And the winner this month gets???? Can you guess? Yep! Sin City Stamps! Please go by the Sin City Stamps Facebook Fan Club and JOIN us! Join us in this fun and exciting time with our own CT KIM!! 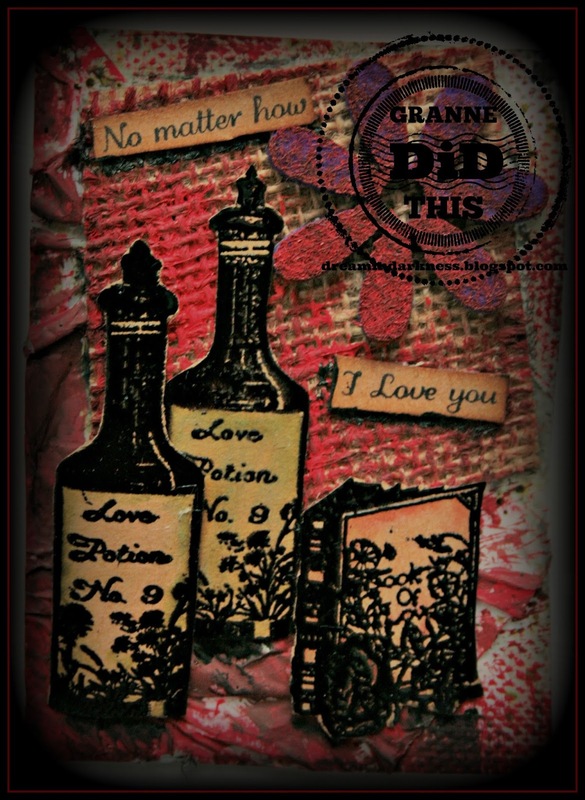 Now look and see what fab stamps YOU want from Sin City Stamps from the teams awesome play time! After black gesso all over the page, (made from Seth Apter's Splatter Proof die) swabs of Black-Green, Black-Red, Black-Blue Burnt Umber and Dioxazine Purple, some sweeps of Zinc white (which is a transparent white, whereas Titanium white is opaque). 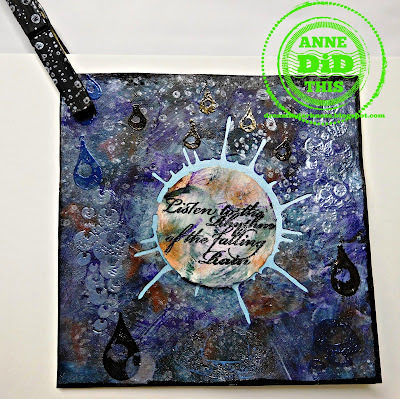 Archival's Brilliance inkpad in Pearlescent ice blue on the waterdrops background stamp, various other water stamps round and droplets heat embossed in black, or Lindy Stamp Gang's powders: Angel Wings Mauve, Silver Moon Sapphire, Twilight Blue Slate, Queen Sheba's Silver, and Midnight Gold Obsidian. I managed to pull together this fat page despite the fact that my trusty heat tool bit the dust...methinks it was Karma reminding me to stop waiting til the last minute! I called upon my trusty crafty stash to come to my rescue. 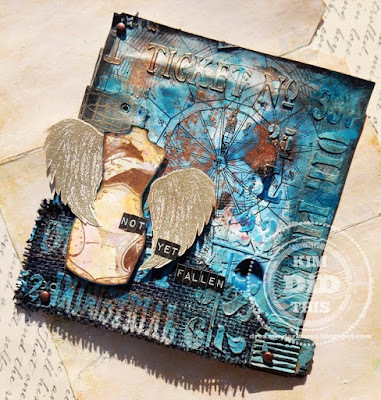 The base papers are fabulous Mixed Media papers by Brutus Monroe. 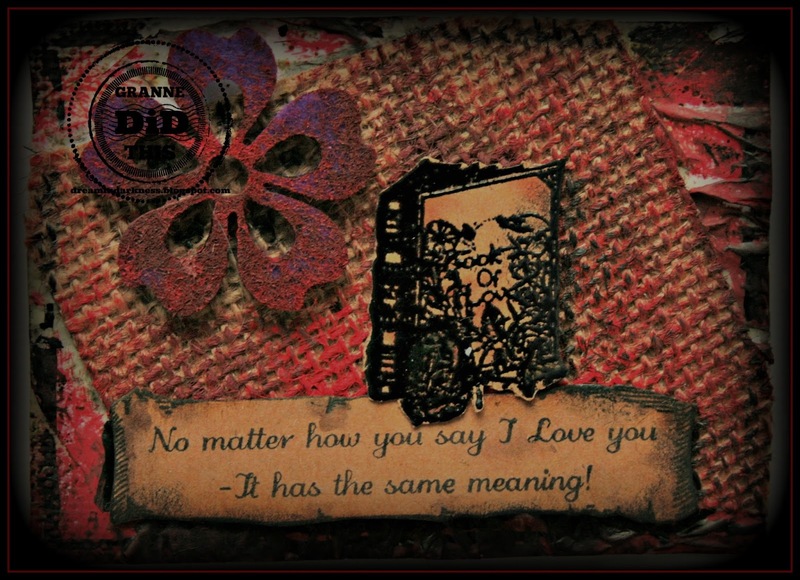 The color is provided by the dynamite DecoArt Fluid Acrylics. 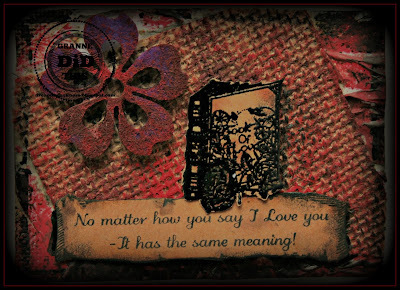 Dimension and depth are found by using DecoArt Modelling paste, hands down wonderful! 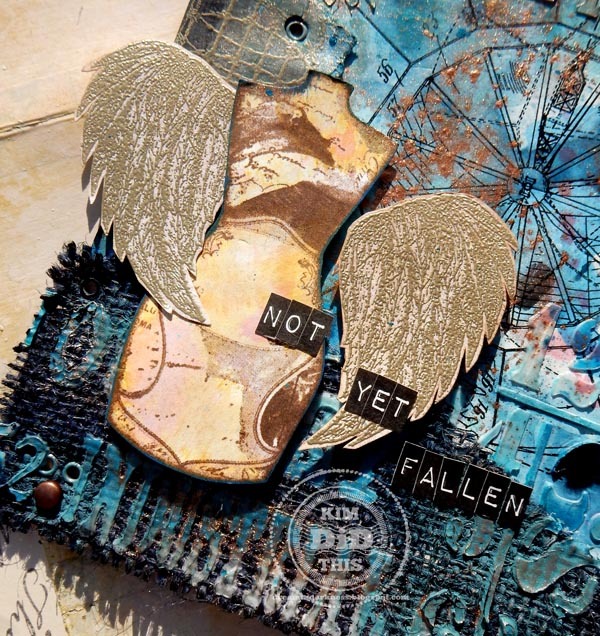 Paired with a steampunk stencil by Andy Skinner. The star of the fatpage, well one of the stars, are the wickedly cool stamps by Sin City Stamps. I can say that in having made the rubber(err well hubs does that part) but I get to ink them up and cut them and ...smelllll...the rubber! and how Lady Luck can be on your side or absolutely absent! This journal page started as a catch all sheet but with some added colors it was what I wanted with the light and dark! I used every element in the Las Vegas Fun! sheet..what fun it was, too! And yep that is real shredded money courtesy of happy mail from CT Anne from SilverCrow Creations! We can't wait to see what you can show us this month! And please visit Sin City Stamps and have a look....uh hmmmm the Frog is very keen on Sin City Stamps soooo you might want to make sure you go by and give that FB like and take a look and of course! enter this month for stamps!!!! Really love the first piece. 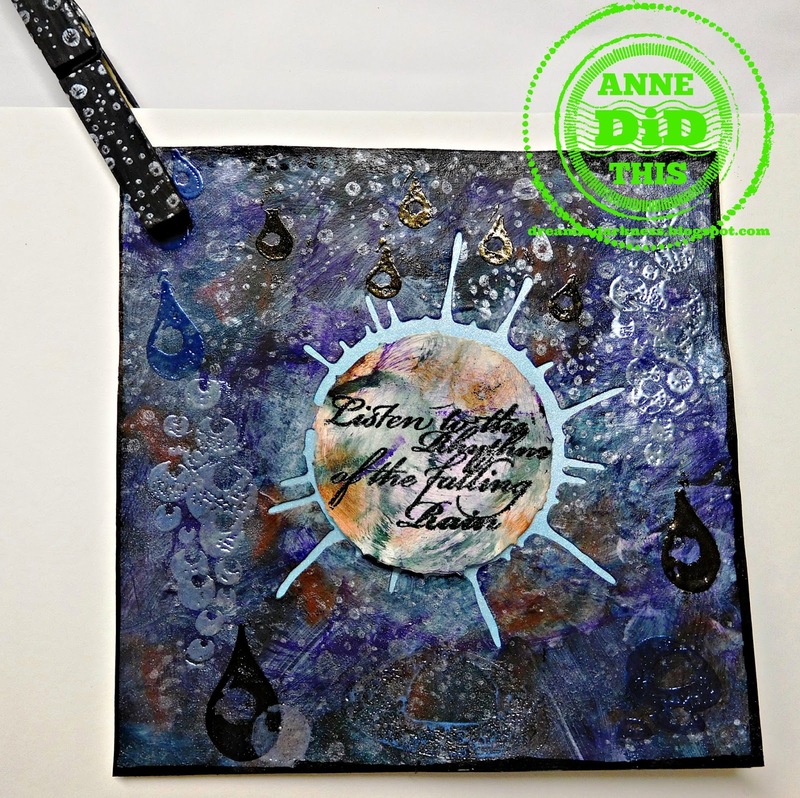 Those raindrops, the dark colors, and Splatter Proof! Perfect. Thanks Seth, and the Summer Drought has just broken! I love the Las Vegas one. 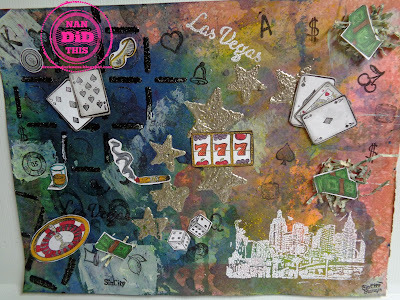 I was on a trip to Las Vegas while I was playing all the games over at Sin City Stamps a couple weeks ago. Do we enter for the March challenge on the Sin City Stamps Fan Page? Congrats to Kim and Sin City Stamps. Great DT samples on display. Thanks for the "darker arts" challenge site. Awesome creations from team. I must unleash the Darkness again.